This blog post follows up on that - with some more top tips in an easy-to-share format. Biggest part is turning up. Get there early though, before people get into their own little huddles and you can't break in. Try to introduce yourself to the main person, but be just as nice to (and interested in) everyone else. People want to work with people that they like and know. They have to like you as well as your work. You’d be the same. You’d want to work with people you got on with, too. So pitch yourself, more than a single project - which may not be right for the other person. The things you’re talking about are well known to you, so you talk through them fast. This could be coupled with the desire to just get to the bar fast. This is akin to the man who decides to drive home at top speed because his brakes are broken. Slower means you look more confident and you are less likely to trip over your tongue and come across like a gabbling fool. In the social media world, business cards can seem old fashioned. 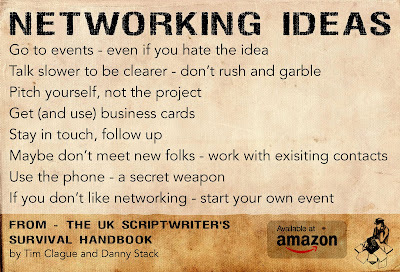 BUT, when you go to a networking event, its fun and exciting to meet all the new people. THEN, later, the "fog of networking" descends. Who was who? What did you talk about? You want to look someone up on LinkedIn – but how did they spell their name exactly? Hand out your cards – and use that as an invitation to collect other people’s. All of this networking activity counts for nothing unless you do something with the contacts you collect. Follow up. Sometimes you know enough people. They just don’t know enough about you. Approaching new people can be daunting. Talking to people you already know, less so. Use your existing contacts. Do they know fully about all your skills? What if there isn’t an event near you, or not quite the one you want? Then start one. Create something small and well targeted, and use helpful free online tools. The benefit of starting your own event is that it puts you at the heart of the networking opportunity. Guests come up to you rather than you having to approach them. 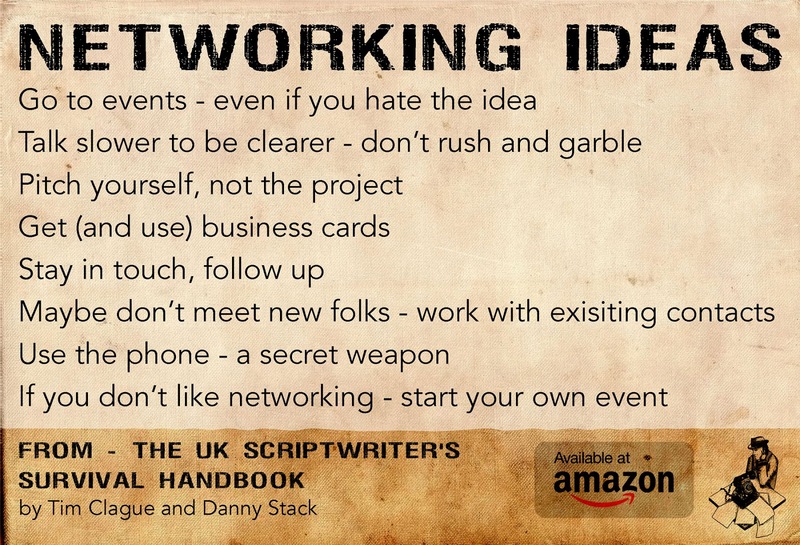 All this good stuff and more is available in our book, The UK Scriptwriter's Survival Handbook, which is available on Amazon as a book or on Kindle - and also on many different formats.